For your Root Cause Corrective Action system we recommend following an eight discipline (8D) approach to resolving internal and external Quality Issues. Your company should have a documented system that describes the method employees follow during the corrective action problem resolution. 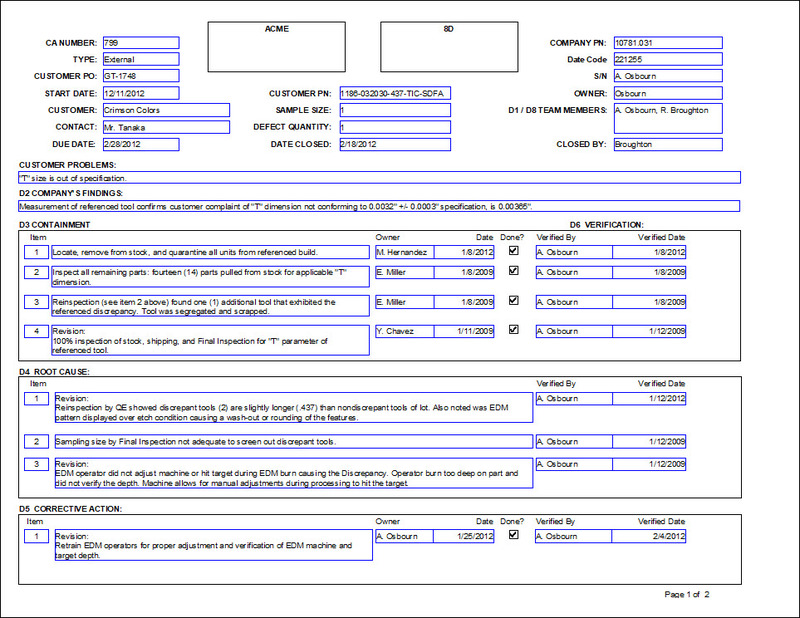 This document is necessary for ISO 9001 certification. Internal corrective action deals with issues within your business. This can include product quality, process or business systems issues. External corrective action is initiated by your customer. Normally these deal with product quality but they could be business systems issues too. Your system must track the corrective action from beginning to end. A spreadsheet can do this. Software is better for this purpose. The corrective action process gathers much reference documentation from beginning to end. All this material should be kept together. Keep it in a manila folder or hyperlinked in your 8D Software. Preferably software is used and all material can be hyperlinked to the corrective action record. 8D Manager will centralize the reference material for ease of review by the corrective action team. In addition, your tracking system must distinguish between open and closed corrective actions. Within your Corrective Action documented system describe who has the management responsibility. This person needs to have full authority to assure the implementation of the corrective actions. When managing customer complaints, timely response is critical. Do not leave the customer hanging when they initially complain about an issue. At the beginning of a complaint a customer will be very responsive in giving information to help you resolve the problem. If the customer is ignored then the customer responsiveness will turn to disdain. The customer will immediately start looking for another source. Your current business and future business is at jeopardy. We recommend an initial written response within 48 hours of the initial complaint. Within that 48 hours complete and document the 8D containment. The Quality record for the root cause corrective action should cover all of the elements of the 8D process. Responsibilities and dates of the corrective actions will be on the record. The record should have an ID number that separates itself from other corrective action forms. You need a documented method for solving problems. Customers need assurance that you have a method to resolve their issues. It is critical for ISO 9001 certification. Learn how to handle customer complaints with your initial response.